Now that i ended subscription on Netflix, it is time for me to catch up on a lot of Bollywood and Some Tollywood movies on my remaining subscription on Yuppflix and on Youtube. Now, not for me are critically acclaimed or family or NRI type movies. The Hero - Love story of a spy. Really was fun when i was watching this with a friend over Vodka. Nobody else seems to like this movie. Plot - Who cares - Anyway, it is brothers split by bad guys who do dishum dishum and reunite at the end. What to expect. 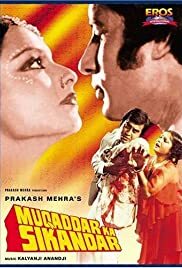 Heavy dialogues like 'Hum me itni taaqat hai ki chattan ko hila de, lohe ko mom kar de', from Jani Raaj Kumar supported by similar ones from Shatru Bhaiya and some over the top action scenes. Plot- Big B has the knack of ending up in trouble and tragedy since he was a kid. But since he is the hero, he manages to come out of most of the situations execpt the following love tangle. Amjad Khan loves Rekha, who loves Big B, who loves Rakhee who loves Vinod Khanna who loves Rakhee back. How does the script resolve this? The reciprocating couple Vinod Khanna and Rakhee get married. All others in the tangle die. Mudassar ka Sikandar.. sounds like a gay movie. The name also sounds like secularism and appeasement which the movie is. Sure it was a hit among peaceful people. I saw some 15 minutes of the movie when I posted this. Anyway, finished it now. The brothers do reunite, but one of them kills the other one in the end. Plus there's phased reunion with lover, aunt and sister. Wanted to talk about "Vodka Diaries" that was recently posted on einthusan. Started watching this movie and just about 30 - 40 minutes into it. The story just blows your mind. 5 deaths in that time... a complex but fun relation between hero and his wife. And at the point where I stopped the movie (lack of time), one of the dead is alive. The hero is confounded... the expression on Kay Kay is worth seeing. The movie is presented beautifully. Scenic views of valleys and mountains. Excellent all round acting. Good dialogues... and poetry that is top class (saneless musings class ). The interaction between Kay Kay and his wife is itself worth seeing the movie... especially at the laugh in this speech. So, question is... will the director keep up the momentum and then eventually explain everything in a rational way Or is s/he going to go the arty way and end it with the audience trying to figure out what happened Because the movie definitely seems to be headed the Big Lebowski way if done right. Keeping my fingers crossed. Despite it getting as high as 7.5, i am going to watch this. it's so bad that it's good.. is how the rating was arrived at.. this movie has become a cult classic in the last 10-15 years among boys and men who love dirty vulgar language.. like 16 year old boys wrote the dialogues.. every sentence starts with lund, ends with choot, with a few macho pencho and messed up things thrown in between.. after 5-10 minutes though, you get tired of the repetition of crappy stuff. Nobody can think of watching it with family around..
Last edited by sarv_shaktimaan; July 19th, 2018 at 07:36 AM.